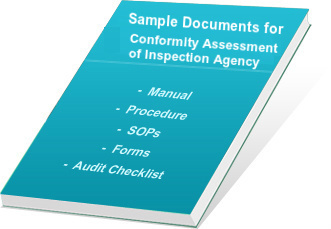 The Inspection Agencies require certifying with International System for Conformity Assessment. Our documents, designed for Inspection Agency, are necessities for the actions of various types of bodies performing assessment for inspection agency. Primary requirements of system certification are instruction manual, measures (procedures), and audit checklists, which are most significant part of documentation process for ISO 17020:2012 certification. We offer quality documents for ISO 17020:2012 Certification, which are editable and take care of major general and technical requirements. This is a big advantage as any user can adapt and change the templates as per their organization functioning and create documents for their company. This document kit is in compliance with conformity assessment standard released in March 2012, which helps users to easily create fast and effective conformity assessment for the inspection of Independent Inspection body (Third-party Inspection Agency). The Documentation Kit for Inspection Agency is designed to help inspection bodies in preparing quality documentation for conformity assessment. The readymade ISO 17020:2012 documents are designed with easy editing features and compatible with clause-wise requirements of system. The user can update system documentation templates as per organization working system and create documents for ISO 17020 of their company in minimum time duration. We can assure that, our packages are competitively priced and completely meet the system requirements for making complete documentation. Sample assessment manual for inspection agency (8 Chapters and 2 Annexures). Conformity assessment mandatory procedures (14 Procedures). Exhibits and Standard Operating Procedures (02 Exhibits 06 SOPs). Set of more than 28 sample forms and templates. Audit checklist of over 200 audit questions, which can be customized to make your own internal audit checklist. Entire documents for inspection agency are available in editable format, so it is very easy to edit and format them as per your organizational requirement. Our documentation kit for ISO 17020:2012 Certification will guide users to achieve fast and effective conformity assessment system certification for Inspection body or third party Inspection Agencies. Our packages are competitively priced. Users can easily amend and change the templates as per their operational system and create their documents for easy ISO 17020 certification. Users can easily change the given templates as per their working system and create their documents for quick certification. Procedures and formats provided in our documentation kit for Inspection Agency System can help in fine-tuning the processes and establish better control over management system. Saves much time and cost in document preparation. It gives value for money to customer. Ready-to-use documents in .doc format reduce your time in documentation process as well as useful in training of staff for learning conformity assessment requirements. Takes care for all the sections and sub-sections of requirements which gives confidence and improves the system. It helps in making documentation including ISO 17020:2012 manual, procedures, forms and audit checklists for quick certification. On successfully completion of payment process, we will provide username and password to download the product from our ftp server. The delivery of our products will be within 12 hours of payment confirmation by secure third party payment gateway. View free Demo of ISO 17020:2012 Documentation Kit and Purchase it with secure online transaction with Paypal.com. Our products are used in more than 65 countries.